long by 1.3″ round) with a clean, modern look and the ball-joint bracket makes the camera easy to adjust in difficult to mount locations. 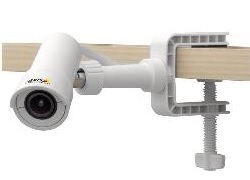 In addition to the standard mount it comes with a clamp mount ideal for temporary installations. The camera has a fixed focal lens with an 80 degree horizontal field of view. The camera does not include day/night capability and is therefore only suitable for relatively well lit environments. 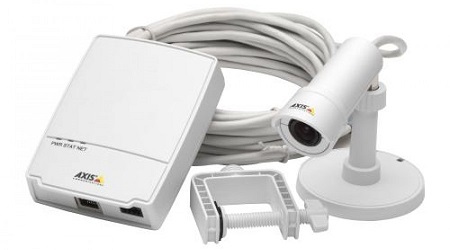 Click here to view the Axis M-2014-E series camera brochure. Click on the box below to watch a video on the benefits of the M2014-E cameras along with actual sample footage. Lens: 2.8mm fixed focal length, 81 degree horizontal angle of view. 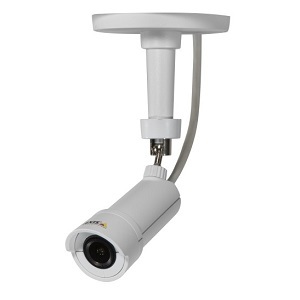 Analytics and applications: Video motion detection and active tamper alarm included, additional functions available via Axis Camera Application Platform.